Appointment of Agnelo Fernandes as the South Goa District Collector has not brought about any turnaround in the sanitation issues plaguing the Matanhy Saldanha Administrative building. In fact, stink pervades the majestic building, inaugurated just around half a decade ago, throwing up questions whether Swachh Bharat mission had any meaning at the seat of the district administration. 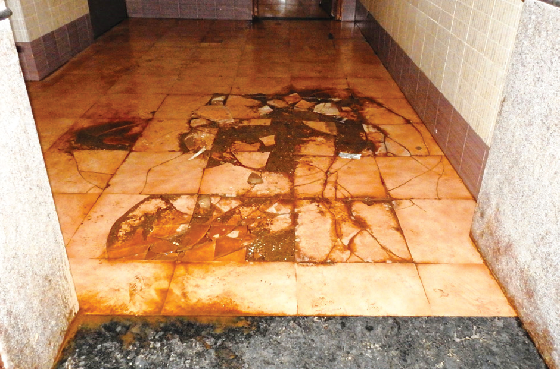 When The Goan team descended on the fourth floor of the building, which incidentally houses the office of the District Collector, the toilets and wash rooms located near the lift revealed a sorry state of affairs. Collector’s office is located just a few meters away from the toilets and wash rooms on the same floor, but the dirty environment left a host of questions unanswered. Members of the public are demanding to know whether the Collector is aware of what’s happening outside his air-conditioned chamber. Consider this. Of the four urinals, at least two were flooded with urine due to a blockage, indicating that these have not been repaired till date. A senior citizen, who had come to use the urinal, wondered whether the Collector is aware of the pathetic sanitation condition prevailing just outside his office and right under his nose. “It was pathetic that the urinals were full to the brim with urine. There was urine odour emanating from the wash room, but it seemed the officials have no time to ensure basic upkeep and cleanliness of the toilets,” remarked a senior citizen. The less said about the toilets is better. The toilets wore a dirty picture as these have no flush facility as a result of which people cannot use them. The situation on the ground floor was no better. The unbearable odour emanating from the toilet block left many a citizen complaining about its poor upkeep and maintenance. The very entrance to the wash room lies damaged with broken tiles and water stagnation. The situation was aggravated further on Monday as thousands of job seekers inundated the ground floor of the Collectorate building to submit their job application forms. Collector Agnelo Fernandes was unavailable for comment on the pathetic sanitation problem in the building. He was holed up in his chamber when the media wanted to seek his comments on the worsening sanitation woes in the building and to find out whether any steps have been initiated by his office to ensure “swachhata” in the complex. Hundreds, if not thousands, of people visit the Matanhy Saldanha Administration Complex every day for official purposes. The complex not only houses the revenue offices, but other government offices, ranging from panchayat authorities to sub-registrar and land revenue.